SYNQ3 provides guest-centric solutions to help your business thrive in the Restaurant 3.0 World by bridging the gap between the past, present, and future. 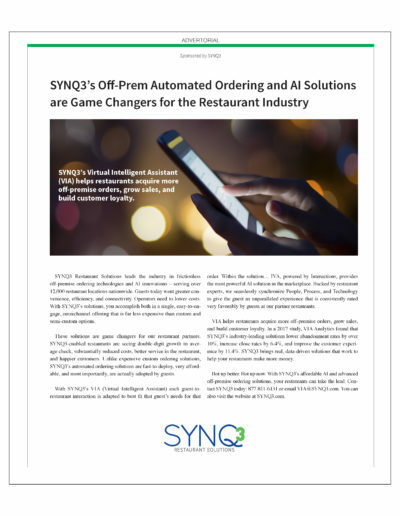 SYNQ3 leads the restaurant industry in the development of innovative, restaurant ordering technology with tools like VIA that utilize automation and artificial intelligence to significantly improve guest experience. SYNQ3 can help you dramatically expand your take-out orders and take-out sales by offering a comprehensive program that increases transactions, grows average check, improves efficiency, and lowers costs. 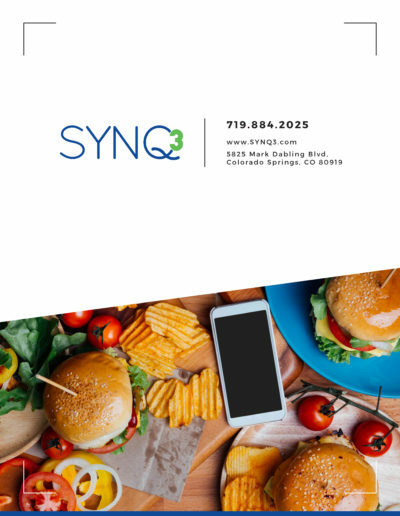 SYNQ3 can help you grow your catering business while lowering your labor costs by providing an integrated solution that drives additional transactions, increased purchase frequency and builds relationships. SYNQ3 can help you substantially deepen your relationships with your guests by synchronizing people, process, and technology to deliver maximum sales, at the lowest possible cost. SYNQ3 Restaurant Solutions (SRS) has been helping restaurants increase average check, improve up-sell, enhance order processing, and provide better customer service both on the phone and on location (through our omnichannel digital transformation solutions) for over a decade. Our programs deepen and enhance the customer relationship to dramatically improve the scope of your guest experience. SYNQ3 Restaurant Solutions is all about helping you take your restaurant to an entirely new level. Our proprietary technical and order processing solutions are helping some of the most prestigious international restaurant companies build relationships, increase sales, reduce costs, and enhance their overall customer experience. At SYNQ3, our mission is to transform the restaurant industry by cultivating deep relationships through the synchronization of people, process, and technology. At SYNQ3 Restaurant Solutions, we have just one goal: to make your take-out guest experience the best it can be. To do this, we bring technology, proprietary processes, and innovative applications together to streamline the entire take-out ordering experience for both your customers and your staff. SYNQ3 turns strangers into honored guests. 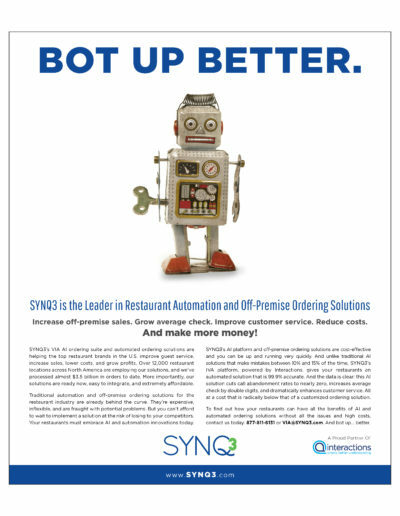 SYNQ3 Restaurant Solutions is the pioneer in order processing and guest relationships for the restaurant industry. Our program has been embraced by some of the most prestigious restaurant chains in the world and we have processed billions of dollars in orders to date. We are the unquestioned leader in the industry and have developed a broad spectrum of capabilities to support our clients. If you are looking for a way to improve your restaurant sales while reducing costs and creating a VIP guest experience, we invite you to contact us. We would be pleased to present you with how SYNQ3 Restaurant Solutions can make a significant difference for your organization. Please contact us directly at 1-719-884-2025. Or send an email to Solutions@SYNQ3.com. 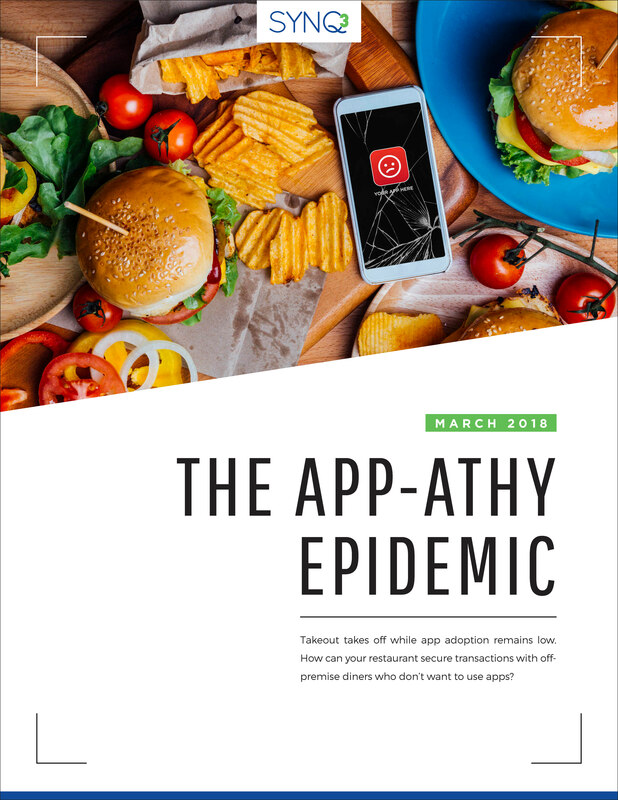 For the last few years, the restaurant industry has experienced several major shifts in technology and operations from mobile apps to ordering kiosks to meal vending machines. In the midst of so much change, many restaurants fell behind. Only a few industry leaders with big budgets found success in this Restaurant 2.0 World, and now, even they are falling behind as we move to the next era of restaurant operations: Enter Restaurant 3.0. The Restaurant 3.0 World is all about enhanced guest-centric service through the use of technology such as automation and artificial intelligence. And really, it’s already here. Just look at other industries and see how these new technologies are transforming consumers’ expectations in purchasing interactions and day-to-day activities. We have drones delivering packages, customers ordering pizza through at-home speakers, and people using mobile voice-commands to turn on sprinklers. We’re in an omni-channel era where businesses (restaurants) have to give consumers multiple avenues for interaction. It’s all about what the customer wants and how they want it at any given time. In other words, it’s meeting the guest where they are at. At SYNQ3, it’s our job to recognize consumer trends early and start developing technologies to best serve the changing desires of restaurant guests. Meeting the guests’ desires first is always the key to driving restaurant profits. That’s why as soon as consumers showed interest in early forms of automation and artificial intelligence technologies, we started brainstorming and developing. Our team took the first steps toward driving the Restaurant 3.0 World. And, the great news is: with the automation tools we’ve created, your restaurant can leap past the Restaurant 2.0 industry leaders at a fraction of the cost and with an even higher success rate. Automation is the future of the restaurant industry. Selecting successful technologies and adopting early will be the key to your restaurant’s success. 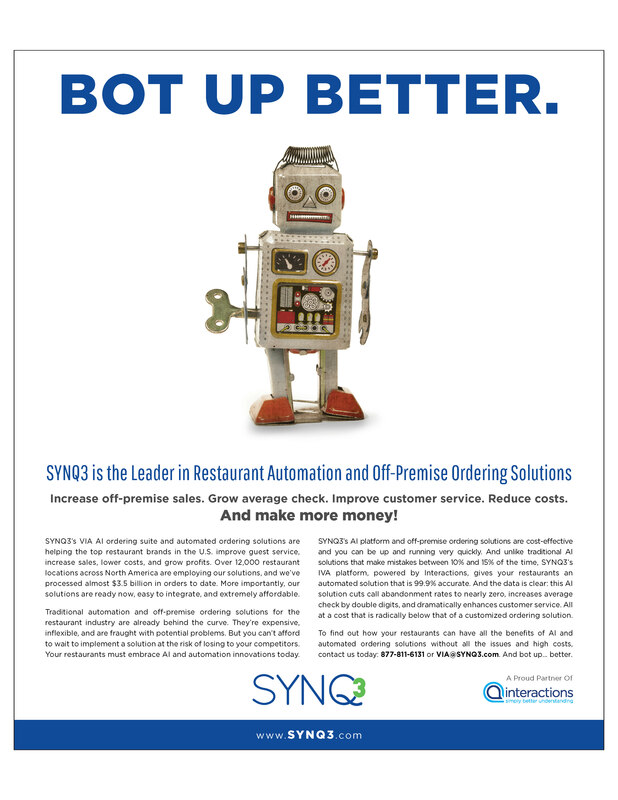 Find out more about SYNQ3’s restaurant automation technologies! Disruptive innovation and a unique ability to foresee and adapt to what guests want today form the core of what we do at SYNQ3 Restaurant Solutions. And they are the keys to our company’s rapidly growing success. As they say, the proof is in the pudding. Our solutions are now deployed at more than 12,000 restaurant locations nationwide… and growing. We recently surpassed $4 billion in off-premise, takeout transactions processed. 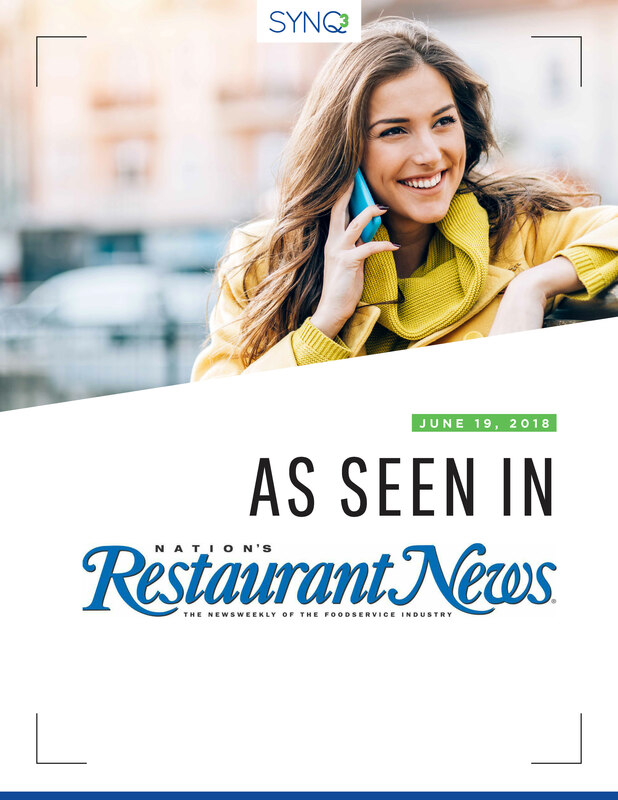 And, the technologies we offer continue to expand as we identify the best ways to meet restaurant guests where they’re at, with the service they want, while significantly boosting restaurant efficiency and profits. The dramatic, personal growth of SYNQ3 is based solely on the remarkable successes of our clients as a result of our solutions. 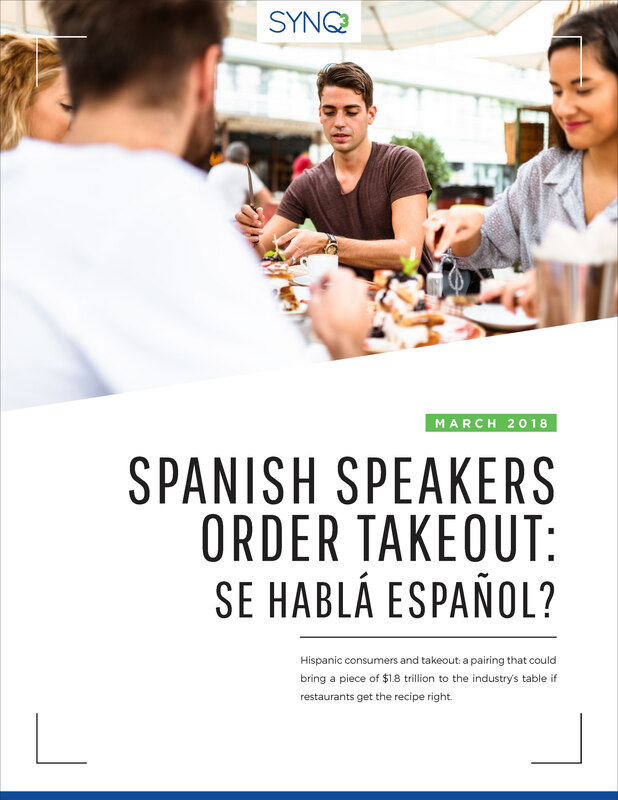 The restaurants implementing Rapid Reorder, Bilingual Center services, SYNQ3 University, and VIA’s advanced, synthetic intelligence are acquiring unprecedented insights, increasing profits, and obtaining a competitive advantage in today’s market. Plus, the adoption rates for our technology, unlike many apps and other tech the industry hoped would attract guests, hits levels of more than 50 percent of identified, returning guests, and those numbers have occurred in less than a year after the tech’s deployment. At SYNQ3, we are leaders in the restaurant technology space because our solutions and our services are different. We provide agnostic solutions that can be adapted to seamlessly integrate with other voice-enabled technologies. And, we deliver on our promises providing services that exceed expectations. 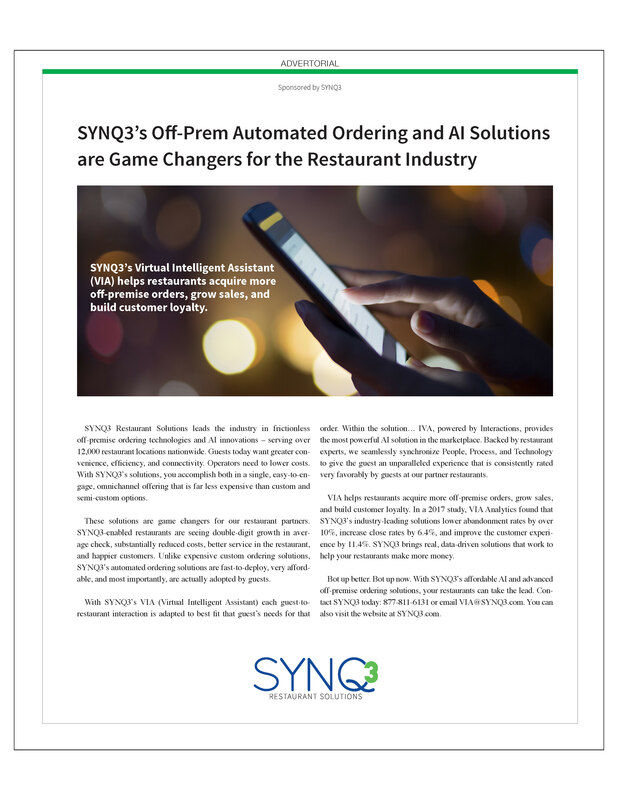 I am confident that the SYNQ3 Solution will revolutionize your restaurants; increase your take-out sales; reduce your costs; improve your guest experience; and, change the way you do business for the better. I would like to invite you to see for yourself how the SYNQ3 Solution can substantially impact your restaurants, your sales, and your guests. Please feel free to contact me directly at SBigari@SYNQ3.com. Or call me at our corporate offices at 1-719-884-2025. I look forward to hearing from you.